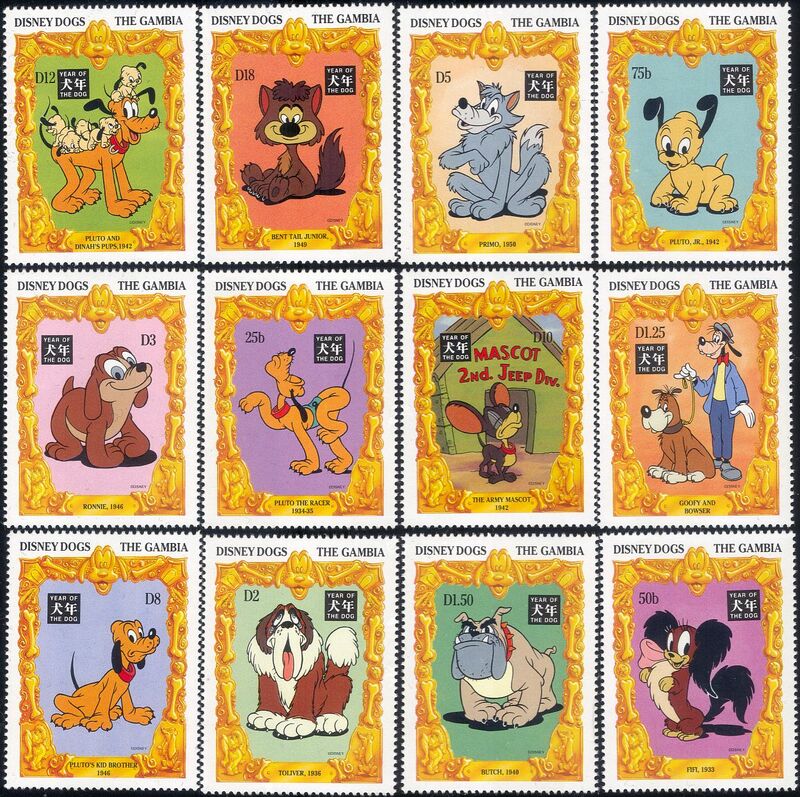 Gambia 1994 Year of The Dog : Walt Disney Cartoon Dogs 12 value set featuring Pluto the Racer (1934-5), Fifi (1933), Pluto Jnr (1952), Goofy and Bowser (), Butch (1940), Toliver (1936), Ronnie (1946), Primo (1950), Pluto's Kid Brother (1946), The Army Mascot (1942), Pluto and Fifi's Puppies (1937), Bent Tail Jnr (1949) - in superb u/m (mnh) condition (Stanley Gibbons 2019 Catalogue Value £19.40) - excellent country, cartoons, film, cinema, dogs, holidays, seasonal, greetings, nature, animals, new year, lunar zodiac, fortune, luck, animation thematics. If you cannot find the specific stamp set or thematic/topic you are looking for either here in my shop or at the brumstamp stamp shop on eBay http://stores.shop.ebay.co.uk/The-Brumstamp-Stamp-Shop please do not hesitate to contact me. Enjoy browsing and shopping. Andrea!